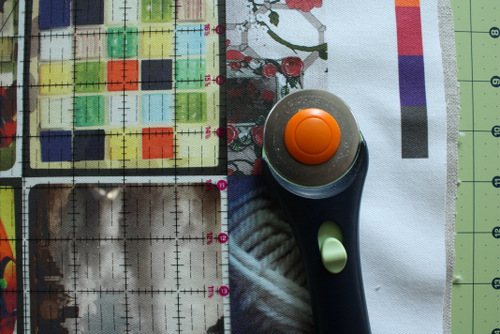 Yesterday, we learned how to use Google Picasa to create a perfect grid of images, and ordered our fabric on Spoonflower. Now for the fun part: putting it all together! Iron your front and backing fabrics. Lay it down on the floor and admire it for a minute. 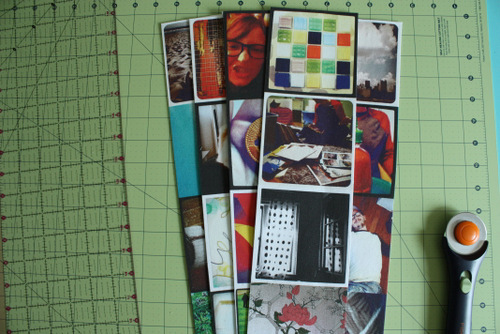 Using your applique or spray adhesive, attach the front fabric to the backing. Follow package instructions for best results. 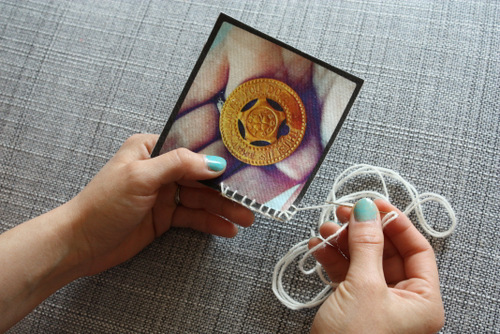 If you only intend to make a specific number of coasters from your fabric, you should cut those specific images out before sticking the two fabrics together. Otherwise, go for the whole piece at once – much easier that way. 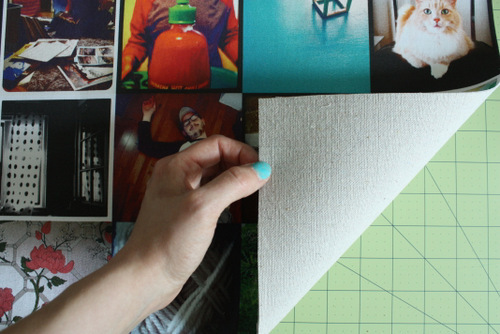 Use your rotary cutters or scissors to cut out your 5 x 4 image grid. Be sure to line up your cuts with the edge of the images – you don’t need any extra space. This can be difficult if all of your images have white or black borders around them, so take your time! 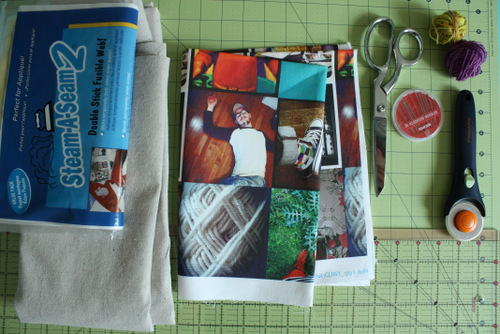 You should now have a nice grid of images with clean edges, with your backing fabric fully attached. 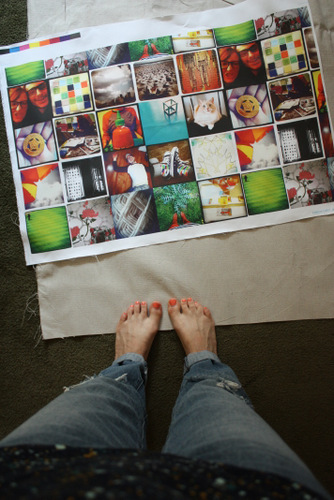 …and finally cut into individual squares. Using your needle and sock yarn or embroidery thread, blanket stitch around the edges! I used this excellent tutorial from FutureGirl. Even though I had used applique adhesive to stick my fabrics together, I was still able to insert my needle between both layers as she suggests to start! It is the best way to hide your knots. 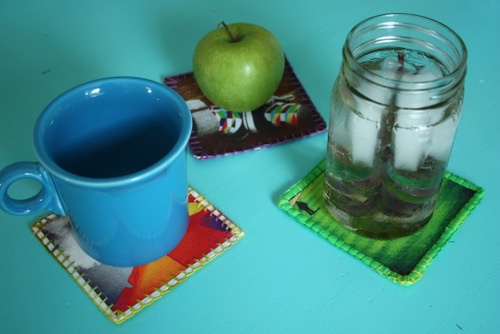 Repeat up to 28 times, depending on how many coasters you are making – and you’re done! 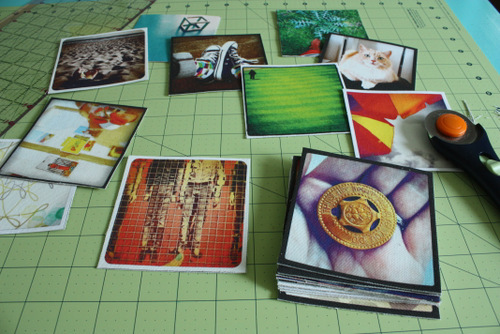 Find some stuff and put them on your coasters! Bias tape variation: See the nice clean finished edges of that green coaster above? I used vintage bias tape from my sewing stash and held it in place while I did blanket stitch over it. It’s a little finicky and definitely takes longer than just blanket stitch alone, but the final product is a bit more polished. I could totally see using a fancy ribbon, too, which might be great for wedding favors – just iron it in half lengthwise first to make it easier. And enjoy! 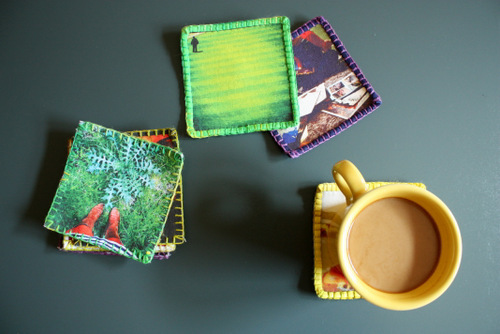 I can’t wait to see how other people interpret this idea; definitely leave a comment if you’ve sewn up some fabric Instagram coasters of your own!